We have been given some information about a relaxed performance of Rapunzel at the Luton Library Theatre on 21st January 2017 that some of you may be interested in. The following is from the Griffin Players who are putting on the show. The award winning local amateur society The Griffin Players are proud to announce that they will be presenting a RELAXED PERFORMANCE of their ever popular annual children’s pantomime. This year the Griffin Players are thrilled to returning to the Library Theatre in central Luton to present Rapunzel: a tangled pantomime. Featuring lots of current popular music as well as traditional classics, the large cast and live band promise to entertain you and create a spectacle that will capture your imagination. We are proud to be the first local society to present a Relaxed Performance, which we hope will be the first of many. We are liaising with local and national autism societies and organisations to ensure that we make this theatrical experience as enjoyable and accessible as possible for our special audience. Our family pantomime will run from Saturday 14th January 2017 until Sunday 22nd January 2017, with our special one-off Relaxed Performance taking place on Saturday 21st January at 11.00am. To offer the greatest amount of support possible and encourage as many people to enjoy our new project we are offering heavily discounted ticket prices, with ALL TICKETS for the Relaxed Performance set at JUST £8.00. (Regular prices £14 and £10). 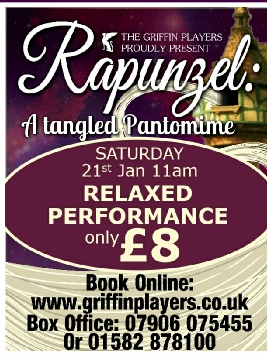 To purchase your tickets visit our website www.griffinplayers.co.uk or contact boxoffice@griffinplayers.co.uk and 07906 075455. If you would like further information you can contact Tim Hayden at thayden@ntlworld.com or Lorna Trapp at lorna_lala@hotmail.com. THANK YOU for your interest and support. We hope that you will be able to join us with this new exciting venture.